A major annual event for AE, the AE Hackathon quickly developed into a full-fletched external platform where customer meets consultant. The challenge? Collaborating to achieve innovative results in a mere 36 hours. Determined to live up to the 2018 Hackathon’s tagline (‘dream it, build it’), no less than twelve teams got cracking to win this year’s edition. Both the jury and all visitors present were more than impressed with the minimum viable products presented at the closing event, and had a difficult time pointing out the winner. One thing was (and remains) clear, though: innovation is in AE’s DNA. A few years ago, AE consultants felt they lacked opportunities to sharpen their knowledge and experiment with today’s innovative (and ever-changing) technologies. Reason enough for AE to set up its very first Hackathon, giving AE consultants unlimited freedom to learn new things without minding budgets or customer constraints. Unsurprisingly, it didn’t take long for our customers to take note of the ideas the Hackathon brought about. A process as intensely creative as the Hackathon is, after all, bound to yield series after series of never-before-seen results which companies can apply to make it big in the long term. From then on, AE started to organize annual Hackathons for multidisciplinary teams consisting of both consultants and clients, evidently still allowing consultants to determine their own course. Flash foreward to 2018. Today the AE hackaton implies much more than trying to deliver a minimum viable product in two days’ time. Consultants look forward to the hackathon for months. Participating in brainstorming workshops – the so-called Ideation Sessions – inspires them to turn customers’ ideas into reality, as well as to tackle the challenges they themselves regularly face as consultants. It’s not uncommon for teams to form during those sessions already, as customers are welcome to provide input, get inspired and work out a pitch. In this way, most teams face the Hackathon with a common mindset from the get-go, although seasoned participants will be the first confirm that a lot can happen along the way and this common mindset may still change in the course of the event. The AE Hackathon is a unique experience for every participant. For consultants, it is a chance to take the lead, while customers get to discover solutions they would never have come across otherwise. 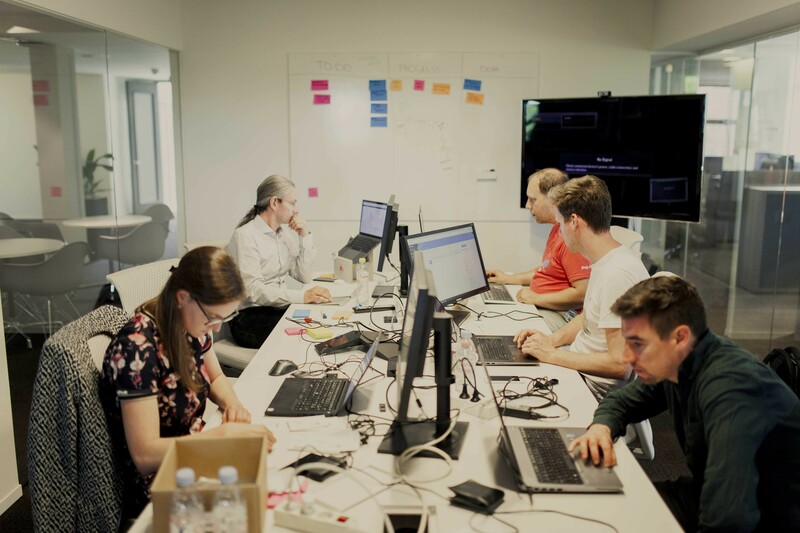 It is therefore not surprising that most customers who take part in the AE Hackathon are more than eager to further develop their minimum viable product after the event has ended.